This research utilizes the Integrated Model of Technology Acceptance (IMTA) study the intention to use computers among first line managers in a mid-sized manufacturing among line managers in manufacturing organization (n=172). 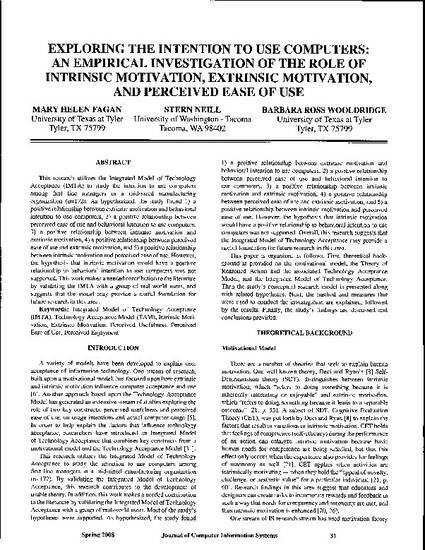 As hypothesized, the study found 1) a positive relationship between extrinsic motivation and behavioral positive behavioral intention to use computers, 2) positive relationship between intention a between perceived ease of use and behavioral intention to use computers, 3) a a positive relationship between intrinsic motivation and relationship between intrinsic motivation and extrinsic motivation, 4) positive relationship between perceived extrinsic motivation, 4) a a positive relationship between perceived ease of use and extrinsic motivation, and 5) positive relationship ease of use and extrinsic motivation, and 5) a a positive relationship between intrinsic motivation and perceived ease of use. However, between intrinsic motivation and perceived ease of use. However, the hypothesis that intrinsic motivation would have positive the hypothesis that intrinsic motivation would have a a positive relationship to behavioral intention to use computers was not relationship to behavioral intention to use computers was not supported. This work makes a needed contribution to the literature supported. This work makes a needed contribution to the literature by validating the IMTA with a group of real-world users, and by validating the IMTA with a group of real-world users, and suggests that the model may provide a useful foundation for suggests that the model may provide a useful foundation for future research in this area. 2008 by Mary Helen Fagan, Stern Neill, Barbara Ross Wooldridge.